Permabond 910 is a single component, 100% methyl cyanocrylate adhesive designed specifically for bonding metal surfaces such as steel, aluminum, and other metal surfaces. Adhesion can also be achieved with a wide variety of other materials such as rubbers and most plastics. It cures quickly to fixture strength in 10 seconds on most surfaces and cures to full strength in 24 hours. It is resistant to most chemicals and short periods of high temperatures. 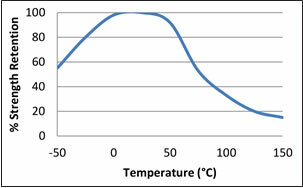 The graph to the right shows percentage of strength retention when specimens were immersed for 1,000 hours at 22°C (unless otherwise noted). *Fixture is when 0.3 N/mm2 shear strength is attained. Handling times can be affected by humidity, temperature and the particular surfaces being bonded. Acidic surfaces or large gaps will also reduce cure speed. 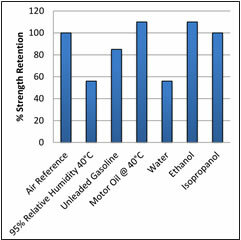 The graph to the right shows results from "hot strength" shear strength tests performed on mild steel after a 24 hour cure-time at room temperature and habituated to pull temperature for 30 minutes before testing. For applications such as paint baking or wave soldering, Permabond 910® can withstand higher temperatures for brief periods, if the joint is not overly stressed. Once cured and depending on the materials being bonded, the minimum temperature that Permabond 910 can be exposed to is -55°C (-65°F). Rub onto surface to be cleaned using a dry or damp cloth. For large areas, use a damp cloth. On large surface areas, PEEK Polish may also be applied using a low-speed buffer. On intricate surfaces, PEEK Polish may be applied using an old toothbrush wrapped in a dry or wet polishing cloth. On minor rust or stubborn deposits, PEEK Polish may be applied with a nylon scoring pad or bronze wool. Using a circular motion, polish the surface until the polish has settled completely into the surface. When preparing to use Permabond 910, bring to room temperature before opening the bottle to prevent condensation inside the bottle, which can reduce shelf life. Prepare surfaces to be bonded by degreasing, cleaning and drying with specimen-appropriate solvent. Note: Some metal surfaces, such as aluminum, copper and its alloys, will adhere better if they are abraded. Lightly apply adhesive to one surface. Make sure components are properly aligned and put together quickly. Apply adequate pressure to ensure adhesive spreads into a thin film. DO NOT realign nor disturb until sufficient strength is achieved (normally in a few seconds). Remove any excess adhesive with a specimen-appropriate solvent (acetone, nitromethane, etc.). Note: This product is not recommended for use in contact with strong oxidizing materials and polar solvents even though it can withstand a solvent wash without any bond strength deterioration. Disclaimer: The data, information and recommendations set forth in this TDS are believed to be accurate but no guarantee of accuracy is being made. We recommend each client make her/his own tests to determine product suitability and performance for specific applications.